Over the years, we've been asked for a curriculum developed specifically for teen dads. But every time we considered creating one, it became clear that our flagship fatherhood program, 24/7 Dad® A.M. really IS written for dads of any age, race, or religion. In fact, with a little digging, we uncovered many practitioners who already faciltate 24/7 Dad® with teen dads with much success. 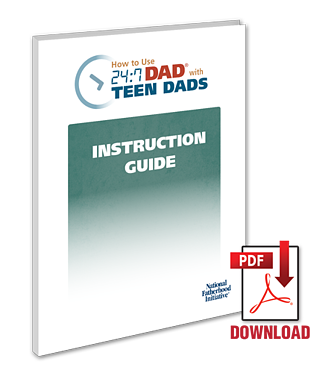 So, armed with expert tips and feedback from those very practiitoners, we created a new companion guide that helps you understand how to effectively use 24/7 Dad® with teens. Read on to learn more and download your copy! Teen dads are a unique audience for sure. They face some similar, along with many different, challenges that an older father would face (even older by just a few years!) Further, they are in a unique, layered parenting situation being that their own parents, and the parents of the child's mother are likely involved—and have a say—in how the child of the teens is being raised (and by whom). These and other situational nuances make delivering a program to teen dads a special use-case for sure. 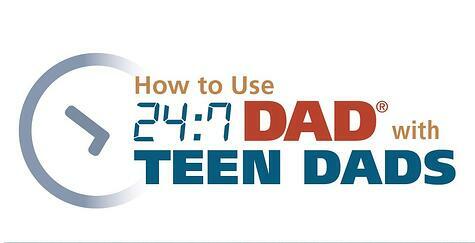 But not to worry, we've created a new instructional guide that will walk you through how and where you can tweak 24/7 Dad® to meet the unique needs of a teen dad audience. And the best news is, you don't have to purchase a new or different curriculum to do it! Let me reiterate that this new ebook is not a curriculum for teen dads. It is simply a companion resource to help any practitioner who currently uses 24/7 Dad® with teen dads to deliver it more effectively (or, for practitioners who would like to begin using it with teen dads). It's also important to note that this ebook is definitely not a comprehensive guide on everything about serving teen dads, as it doesn’t address ALL of the challenges they can face (e.g. difficulty paying child support, finding employment, staying in school, and the shock of suddenly transitioning from boyhood to parenthood). There are other resources that can help you learn how to address those challenges. But, what you get in this short guide focuses on advice and guidance in the form of tips to help you effectively facilitate 24/7 Dad® with teen dads. By applying the tips, you will undoubtedly help teen dads with the broader challenges they face, and run 24/7 Dad® effectively with them. Don't delay - download your free copy today!